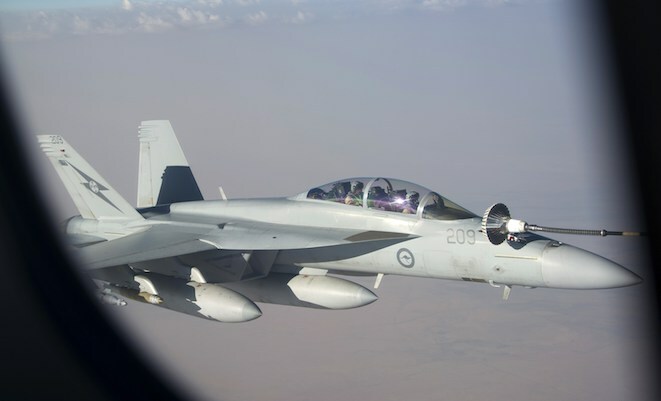 The Royal Australian Air Force (RAAF) Air Task Group that is operating in the Middle East has attacked its first target during a mission in Iraq. In a brief initial statement released on Thursday, Defence confirmed that an F/A-18F Super Hornet strike fighter had dropped two bombs on “an ISIL facility”. Operation OKRA is the Australian contribution to the international effort to combat the Islamic State of Iraq and the Levant. About 400 personnel have been assigned to the Air Task Group, and approximately 200 personnel are assigned to the Special Operations Task Group that has also been deployed to the Middle East. The RAAF needs to bring the fighters closer to Iraq, possibly in Turkey or Cyprus in order to cut down on flying time, costs and the risks associated with mid air re-fuelling. The planes are stationed too far from the target. Historicaly the Western Block of Nations are more often than not -late to react to potential dangerus situations aimed aganst them.God only knowes when we will start learning. The more we hesitate – the more we open the gates of disaster and saffering – all around the world. We have not forgiven the Russians for the abandonment of the Polish resistance – and likewise the world will not forgive and remember forever the Turkish betrayal of the small bleeding nation of Kurds. So I am thinking ; let it happen now – man on the ground – or airforce in the air – lets finish what we started and don’t spare the bombs . If we don’t deal with this religious fanatics now – arm in arm , with the rest of the Western Block ; the world at large will never forgive us…. Isis is a unique target. A disparate, yet what seems a highly motivated force, or movement even, that have so far shown themselves to be a dangerous, myopic breed of jihadi who would think nothing of chopping your or my head off and posting it on youtube. That our Air Force is at least doing something to help wipe them out only seems right. I’d like to believe that the F-18s aren’t wasting their missiles and bombs on useless targets, and are being guided by something far more accurate than radar or location finders – decent, accurate and up-to-date intelligence. Find them, and kill them, then fly back to base. That’s the mission. That’s what F-18s were designed to do. Good flying gentlemen. It is pretty common to tank often so a fighter has plenty of fuel for task. On another note I’d just like to express my support for the ADF members sent and for the families at home. Thanks. We appreciate it. According to Vice-Admiral David Johnston, the FA-18 may have to re-fuel up to 4 times. The KC-30 guys must be getting a bit of practice!